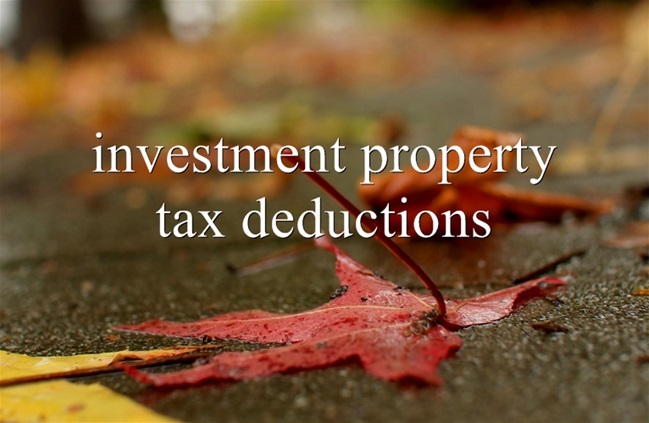 Investment properties have some great tax deductions that you can use to minimise the tax that you’re paying on your property. 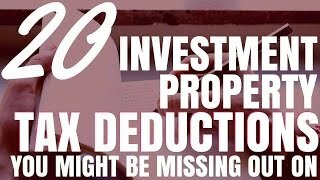 But investment property tax deductions can be very confusing and it can be difficult to understand exactly what tax deductions you can claim. It’s very important that you understand what you can and can’t deduct as an expense or as depreciation. Every single property is going to be different so I do suggest that you speak to a professional accountant to get your own personal deductions done for you. We will now look at twenty different investment property tax deductions that you might be missing out on. This is a great overview for you that I gathered from the ATO website. Number one is advertising for new tenants. There are often advertising costs involved when a tenant leaves your property and you need to get a new one in place. It might be advertising on domain.com.au or realestate.com.au or in the newspaper. But you should be able to claim advertising as a deduction if your property is for rental purposes. Number two is bank fees and charges. Bank fees that are included as a cost to generate income may be able to be claimed as an expense. Please speak to an accountant if you’re unsure. Maybe you have a holiday home that you rent out on a weekly basis and then you have it cleaned. Or maybe you have a furnished property and the tenant moves out and you need it cleaned out. Or maybe a regular tenant has moved out and you need the property brought up to scratch. You should be able to claim cleaning costs as an expense because it generates an income. Number four is the building itself. The age of the building will affect the deduction costs so make sure you look into that in more detail. You can also check out my article about depreciation and how to claim it. Number five is your light fittings, carpets, curtains and other depreciable assets. Your building can only depreciate from the day that it was created. But you’re constantly adding new things to the property. Maybe you’ve updated the carpets or added new curtains or replaced the light fittings. These things have value associated with them that depreciates over time. You can depreciate those assets. I suggest getting a depreciation schedule done by a quantity surveyor because everything depreciates at different rates and it can get very confusing if you’re trying to do it yourself. I have another helpful article that shows more detail about depreciation. Number six is gardening costs. Maybe you have a very large property or a couple of properties on one block of land. The costs involved with maintaining all the gardens should be claimable as well. Number seven is the travel costs associated with inspecting and maintaining the property. Let’s say the property is interstate or far away and you need to drive or fly there. You need to stay overnight to inspect the property or to do some work on the property. Those costs that are associated with getting to the property and maintaining the property can be claimed. However let’s say that you live in Sydney and you have an investment property on the Gold Coast. You decide to go and inspect the property but you’re also planning a two-week holiday while you’re there. Obviously you won’t be working on the property for that fortnight. It is important that you claim only the costs that are directly associated with managing and improving the investment property and not the costs associated with the family holiday. I recommend you speak to your accountant for any travel expenses. This is an area that people might fudge the numbers and probably an area where you’re more likely to get picked up on than something else. Hopefully you’ve got landlords insurance to cover you in the case of the property being destroyed or tenants doing damage or so forth. This should be claimable because you need your insurance to cover you to help you generate an income. Number nine is stationery and postage. This is one that a lot of people forget about. You may need to use stationery or postage to interact with your real estate agent or with the person at the property. Maybe you’re mailing a rental agreement and something similar. Those sorts of costs that are directly related with your investment property should be claimable. But speak to your accountant if you’re not 100% sure. Number ten is the interest expenses on your loan. Obviously there will be interest costs associated with your property’s mortgage. You need to be careful with your loan. If you’re paying principal and interest then only the interest costs will be tax deductible – not the principle that you’re paying off the loan. You also need to be careful because loans that are secured for private purposes – such as to go on a holiday – can’t be claimed as a tax deduction because it’s not for income generating purposes. Your interest is tax deductible in most cases but you need to make sure that it’s used for the investment property and not for private use. Number eleven is capital works. This is when you make improvements to the property. In most cases these can only be claimed through depreciation. Number twelve is a scrapping schedule. This is when you do major renovations to a home and you throw away a lot of things. Maybe you’re ripping up the carpet or throwing out the old curtains. Those things still have value attached to them on paper and you can depreciate that value through a scrapping schedule. I have a video and an article about what a scrapping schedule is. I do recommend that you get a quantity surveyor to do the scrapping schedule for you. But it is a great way to get extra tax deductions. Most people do their renovations and depreciate the new products they put in. This is great for the property. But they miss an opportunity for a tax saving by scrapping the old products that they took out. Number thirteen is council rates. If you own a property you’re going to be paying council rates. This includes things like getting the rubbish taken out or maintaining the street – all of the things that you need to pay the council for. This should be tax deductible for you if your property is used for income generating purposes. Number fourteen is legal expenses. The legal expenses associated with purchasing or selling your property aren’t necessarily tax deductible. But they may be if you need ongoing legal council to help you maintain a rental property or if you’re having issues with your tenant and it’s not associated with selling or buying the property. But again, always speak to an accountant for your situation. Number fifteen is repairs and maintenance. In most cases you can claim if you need to repair something or do some maintenance to the property. You just must be careful because the ATO does have regulations around what you can claim instantly and what you need to depreciate over time. Look at the ATO website to see what sort of things can be claimed as a tax expense and what sort of things need to be claimed as depreciable assets. Number sixteen is pest control. You may often need to get someone to come in to spray the house if it starts to get overrun with pests. This is a cost that you incur to keep the rental income coming in so that should be something that you could claim as a tax depreciation. Number seventeen is land tax. Land tax is incurred if you own a lot of land or a lot of properties within one individual state. This is an extra cost across your portfolio. Obviously that comes as a cost of owning investment properties. So you can claim that as a tax deduction. But be careful. You may need to claim only a portion of the land tax and not the entirety if you’re not using these properties for income generating purposes. Number eighteen is body corporate fees. Body corporate or strata fees should be claimable if you own a unit or a townhouse and you need to pay for the maintenance of the common areas. Number nineteen is property agent charges or property manager charges. Real estate agents will often charge you a percentage of the rental income – maybe 6% to 8% – and you should be able to claim that on your tax return. And number twenty is your utilities. Things like water, electricity and gas that you are paying – not the tenant – should be claimable as an expense as well as a tax deduction. So there you have twenty investment property tax deductions that you might be missing out on. I suggest checking out the ATO website if you want more information.